Once upon a time, I used to hate Target (I don’t know what I was thinking), but over the years, I’ve come to love it. And I especially love the Merona brand. When I heard that Target was saying goodbye to their Merona brand, I was sad. Then I happened upon their new brand, A New Day, at their store a couple of weeks ago. This burgundy utility jacket for pre-fall immediately jumped in my cart. Don’t forget to enter the $700 Target giftcard giveaway here. This utility/anorak jacket from A New Day is perfect going into fall. It’s lightweight with a zip-out hood. I had to have the burgundy color, but there are also five other colors from which to choose. And y’all, the rose gold details are stunning. We’ve already had some cool mornings and evenings here in Kentucky, so a light jacket can come in handy. But it’s not quite fall here yet, with temps soaring during the day. So I layered my utility jacket over a simple tee and jean shorts. I added my new favorite booties (so versatile!) to compliment the rich burgundy of the jacket, along with my Speedy 25. 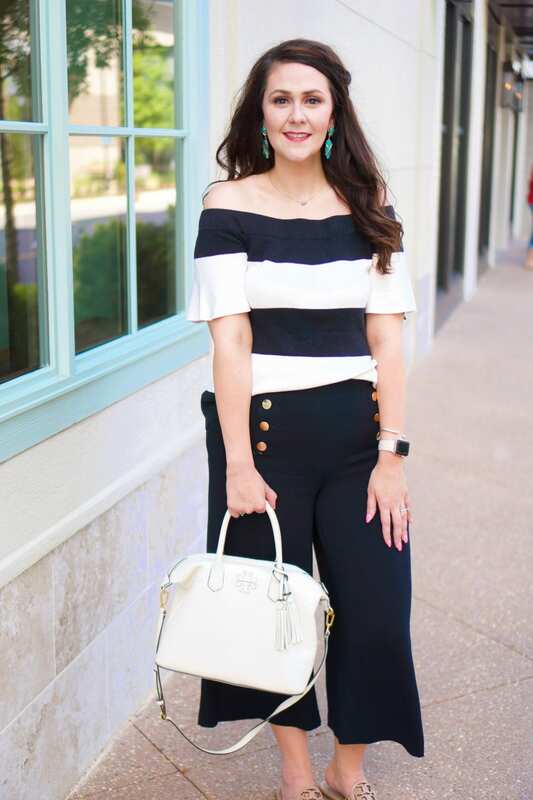 If you’re looking to start working some fall colors into your wardrobe, but aren’t ready for a full-on fall wardrobe, add some fun accessories in summer colors. 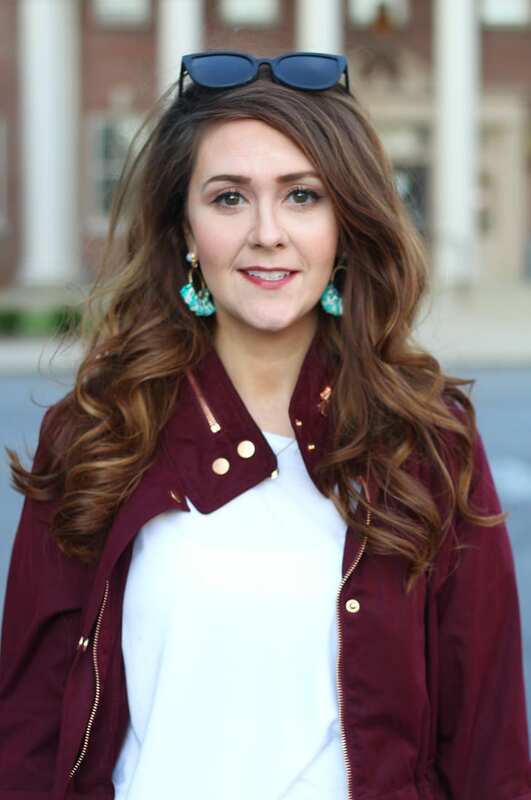 These teal and white earrings look so good and contrast well with the deep burgundy shade. So, confession time: who had already started switching over to their fall wardrobe??? 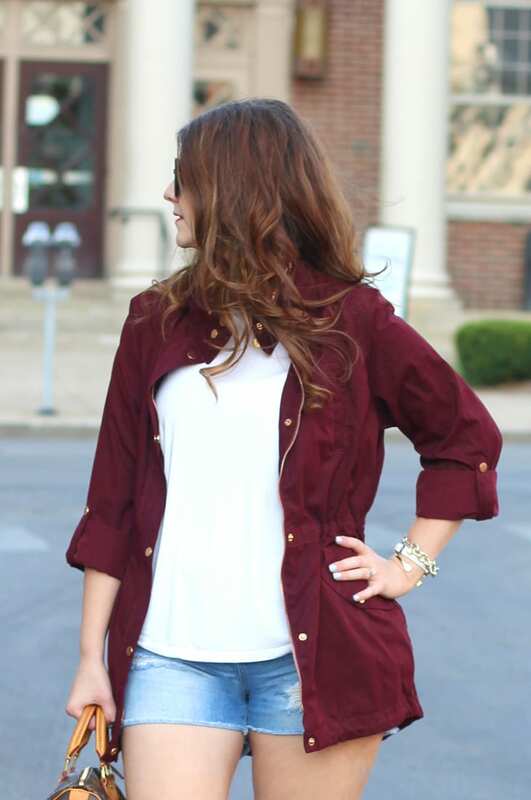 I’ve had my eye on a similar burgundy jacket at JCP for two seasons now. I want it, but I really don’t need it. We just don’t get a lot of use out of lightweight jackets in Wisconsin. It gets cold so fast. I too was shocked about the Merona brand, I don’t shop Target often, but I’ll have to check this new brand out as that jacket is cute! I haven’t started wearing fall items yet. I don’t like to rush it as we have such a long time to wear cold weather items in Wisconsin as it is. Keep it summer as long as possible I say! Okay, not to be super weird – but you make that jacket look so great! I wouldn’t have liked it as much if I just looked at it on the Target site. But anyways – I looked at all the A New Day stuff this past weekend and I love it. Everything is so pretty. I love the color of this jacket on you! Love this color! I need it to be a little cooler for me to start working in my fall clothes but I’m definitely craving the colors! Love this color, glad to see part of the new line at Target, hope that the rest of it is just as good as the Merona brand…please have cheap t-shirts! What a pretty color!! Love that jacket with all the gold details. I haven’t started dressing for fall but I did start doing some shopping today! I love this jacket! I can’t believe it’s already time for fall clothes, wahhh! This jacket is super cute though! Love the color on you! I have an olive jacket, but I think I NEED this burgundy one too! That is such a lovely colour! Oh I love this colour! I have been looking for a nice jacket for when it gets slightly warmer, this looks perfect! I didn’t know they were getting rid of Merona! Sad! Well, this jacket was a great pick. I love the color! That is a great fall jacket, the weight and color will make it a perfect choice! I love this jacket! Looks comfy but still polished. The color is gorgeous! Thanks for joining in on the Style File Link Up! I love Target! Give me Target over Walmart any day of the week 🙂 Unfortunately, they no longer exist in Canada 🙁 Love the look your created! The colour of this jacket speaks to me and I must have a Burgundy jacket in my collection now! This jacket is adorable! They really have upped their game at Target. You will find a ton of ways to wear this jacket!